Finding a place that is sonically unmolested by the roar of the modern world and the steady hum of highways is nearly impossible. Whether you live in a city, the suburbs, or in a small village, sound in the modern world is more or less inescapable. But there are moments of silence. Moments when time sort of holds its breath, to make time seem to stand still. A dry fir partly covered by green lichen standing alone on a boulder is like a symbol of eternity. The echo of past times is uncovered in your mind as history unveils in your imagination. The sound of an old squeaky door is your entry and a look through the old window reveals moments of the past. Anniversary rings in grey on sunkissed old timber logs. Wood is a living thing and the anniversary rings are like records of life. Looking into the fire, Leif Wikner saw the warm light through a piece of bluewood and this triggered his imagination. Chance and the eyes of a curious woodworker saw how the patterns in different pieces of wood could become new light and shapes. Ideas were developed with inspiration from the wild forest of Jämtland, with art as a creative force and expression in the craftmanship. 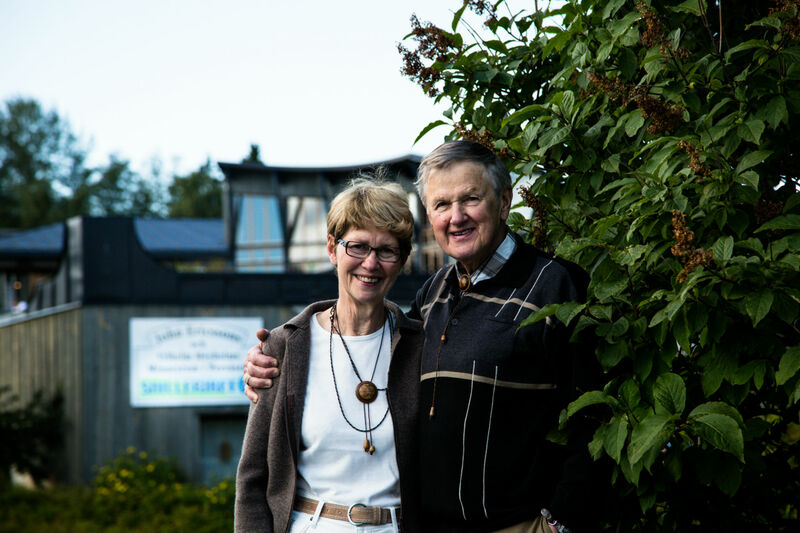 Leif and wife Margith, both teachers, started to search for a place to explore the secrets of the wood on the side of their careers. They found the old forestry school and started bit by bit to develop the woodworking workshop. Wood in all shapes took more and more of the couple´s time and to make use of the creative powers of the wood and the surroundings they started to build a whole center around wood. Today there is visitor center around the wood and the workshop, a restaurant with wooden interior, a hotel where each room has a unique wooden theme, log cabins, a shop for wooden furniture crafted on site and interior details and conference facilities. 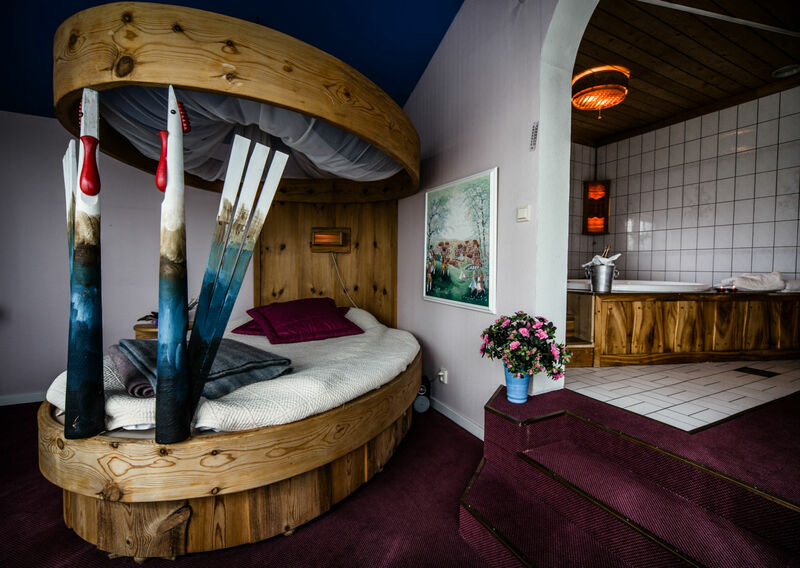 It goes without saying, the wedding suite in Persåsen is equipped with an egg-shaped double bed, protected by two roosters for security, vitality, possibilities and creativity. The rooster is the chosen symbol for the family Wikner. It is for the unexpected, the inventive as well as the protective. Just like the church roosters watching over the parishes from the church towers. The eggs found everywhere around the woodcraft center are for belief in the future, the mother of life and ideas. The art of being reborn can be seen from many angles at Persåsen. In the in-house-production as well as in the art exhibitions and the events of the center. A creative place in a creative surrounding makes room for energy boosts with the guests. The fact that the village Persåsen is in the Snilleriket (genius kingdom) where so many inventors have acted through centuries may not be a coincidence. 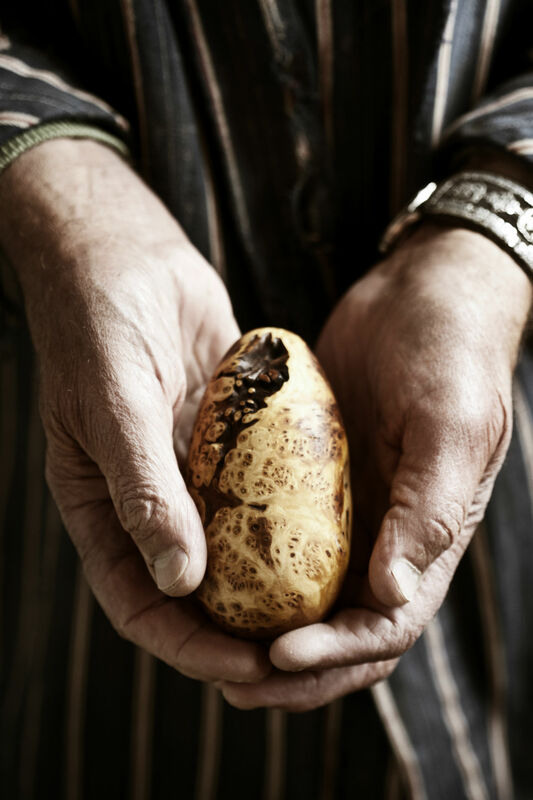 Eggs from Trees - beautiful pictures of eggs made from different kinds of wood in layers upon layers. The woodcrafting and the passion for wood has been transferred to the four sons. Two of them; David och Mattias, run the the facility today and create amazing customized furnishings and furniture for different environments. The furniture is made of sell, larch, aspen, bluewood, beechwood, birch, pine and fir by eye and hand, imagination and creativity. Nature and technology are co-creators that enable new solutions. The customer can follow the production from picking up the tree in the forest to the finished table, chair, bed, shelf, closet or lamp. The results are personal and custom-made furniture that last a long time. Handmade and signed. Often Wikner’s craftsman knows about the tree’s history because they almost always followed it from its plantation. Perhaps you would like to use a tree from your backyard or a care tree that you followed through life. The woodworker gets acquainted with the tree to get its history, but above all to be able to cut it right in front of the processing. The craftsmen at Wikners have their own self-designed mobile saw for so called overgrown timber. A prerequisite for being able to saw the gold of the forest, the overgrown timber in the way that has became special to Persåsen. The alternative to the tall overgrown trees is usually for them to become chips (used for heating) or newspaper pulp. Now, the old fir can instead be turned into a beautiful furniture and placed in an honorary center of your home. A difficult challenge is to damage the tree as little as possible when the bark is separated from the wood core. 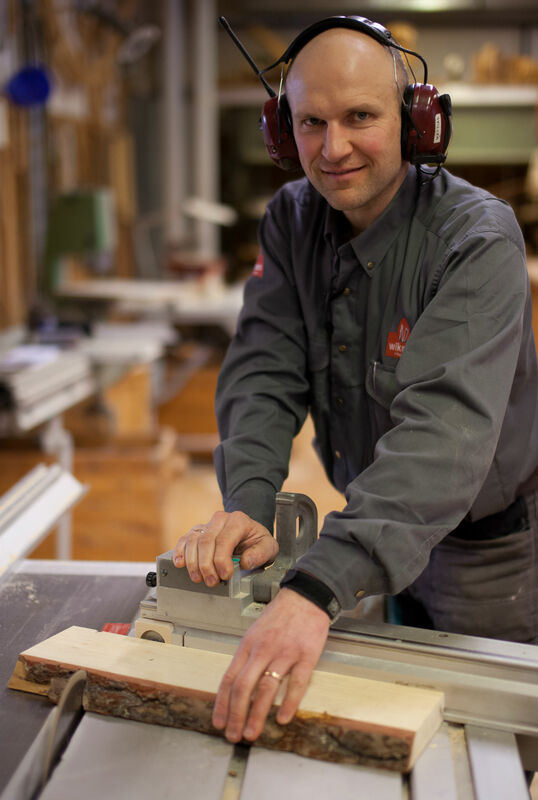 The Wikners craftsmen always try to keep the natural shapes of the wood, which gives furniture from Persåsen a special character. A prerequisite for achieving the lubricity of the surface, characteristic of the products from Persåsen, is this bark separation. The trick is done by adding pure water. 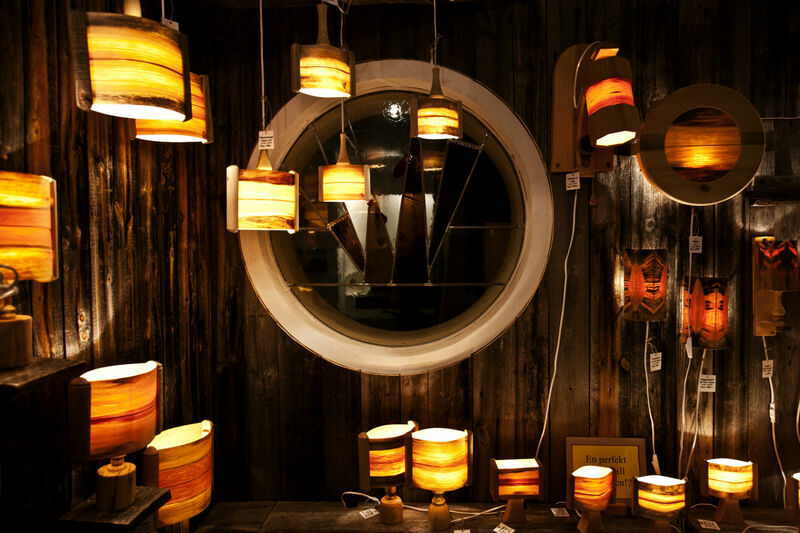 The most difficult moment in the process of making furniture is the drying of the wood. The wood is put in vacuum combined with heat. A method which takes a lot of work, but effective for avoiding cracking in the wood. Now we got the carefully selected and dried wood and then the craft takes on, with the passion, the eye, the feeling, the hand and the technology in perfect timing. Each product is unique, often tailor-made to fit for a special customer in shape and dimensions. 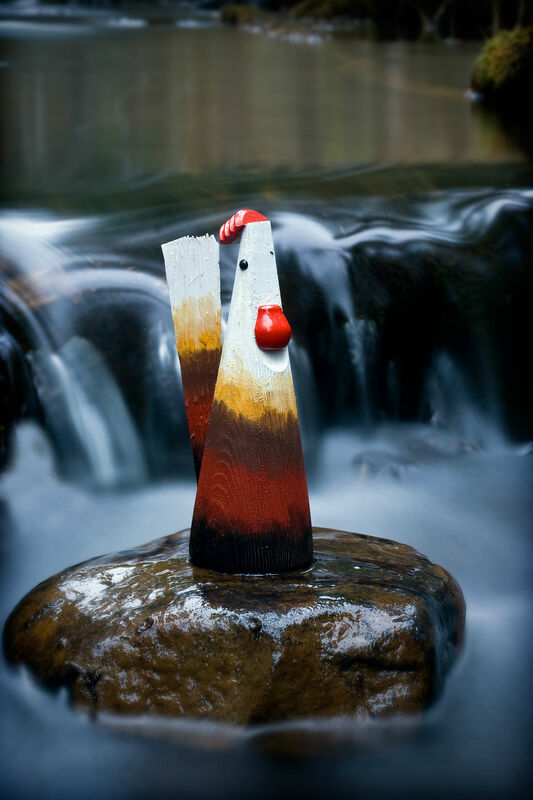 Nature, art and craft in harmony. Mattias Wikner shows pictures and speaks (in swedish) about Wikners in Persåsen. Wikners in Persåsen are open daily in the summer and around holidays. Open to pre-booked groups off season. Regular guided tours in the workshop in summer. Stay and eat at Wikners in Persåsen or stay at Hotel Sydjemten in Svenstavik (20 km) or in Östersund (50 km). Turn off from road 321 at Kövra, follow the Rooster sign. Turn left after 500 meters to Persåsen. The facility is 1,2 kilometers down the road. Enter the facility via the gift shop. Ask for the guided tours of the day. Proceed through the crafts, arts and historical exhibitions. A staircase leads to the restaurant (also separate entrance) and Hotel. The workshop is open to groups/guided tours. The log cabins are close to the facility. Guided tours are offered during summer and by pre booking. Julbord (traditional swedish christmas dishes) at Wikners in Persåsen with local produce. Book your table well in advance! Fäbodvägen (the summer farm/shieling road) leads from Persåsen to Börtnan with some 40 idyllic summer farms in close proximity to the road. Some are visible from the car window (please respect private properties by keeping distance). Hovermo Gårdsmuseum (farm museum) is 5 km from Persåsen. An inventive family lives here and they have built everything they needed themselves. 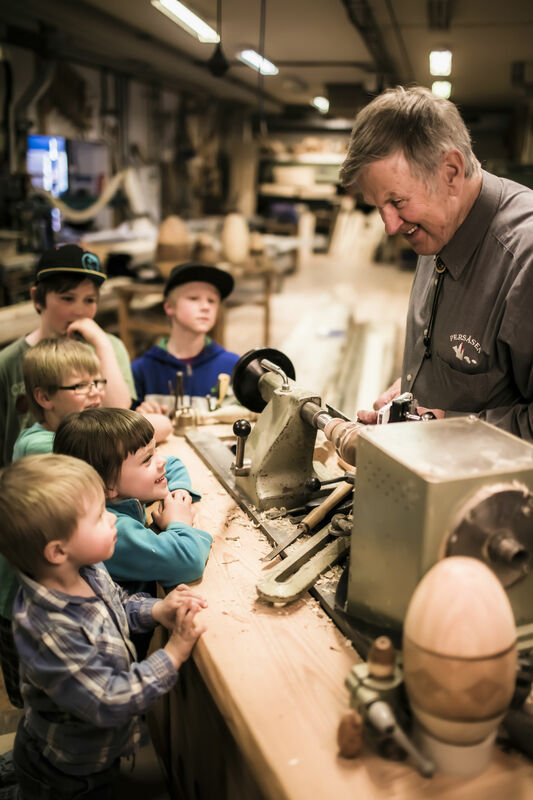 Join a guided tour through the smithy, mill, sawmill, powerhouse and barns.